Happy Sunday everyone. Missed my blog post about houses and furniture? Well good news is here: you will get an overdose today. And you will only see bits and pieces of myself since the main actor indeed is the fabulous new skybox LONDON Appartment from [AF]. And since this skybox is huge (but only has a Land Impact of 58 thanks to mesh) I decided to show you room by room, making a little homestory about how I start my day. So – obviously we begin in the bedroom (above left). I just crawled out of my snuggly bed from Scarlet Creative. The Noelle Modern Bed comes with multiple poses for single and couple usage and what I like most about it is the fact that you can actually move the poses to your needs. The books and the lamp left to the bed are also from Scarlet Creative and they show so much love for detail. The rounded shelf is from [bauwerk] and will become released soon. And the candles are a gift from Designer Prims. So I am on my way to the bathroom. And I am wearing the Silk Flare Pants in autumn bleed which are the huntgift for the Autumn Effect Hunt from 22769 ~ casual couture. And talking about gifts. The washing table in the bath is the new Groupgift from the same store. It comes with three animations (washing hands, shaving and brushing teeth). It is the first piece of furniture I know that works with the new Linden Labs Functions like temporary attachments. Because the washing table attaches the razor or the toothbrush to your hands, but they do not clutter your inventory. One of the things that really amaze me about the LONDON Appartment is the hallway and I am sure you will love it as much as I do. As you can see in the panoramic shot (the middle one) the texturing is gorgeous and not too heavy. So – I found my denims and my jumper and are on the way to the living room and kitchen wich are downstairs. One thing about design in secondlife: there are classics within secondlife. Like furniture that was created in admiration of RL designs and I absolutely love that. But there are pieces of furniture that became already classic pieces WITHIN secondlife. And one of these rare items is for sure the Asylum Octo Lovec Chair from LISPs Bazaar. It is strange, it is quirky and it is a beautiful piece of art coming out of secondlife. Everyone needs that chair (or another one out of this series). Another wonderful piece of interior design is the Light Tree from ICONIC you can see in the middle shot in the first floor. As you maybe know I come from Germany – and around here it is common that we a) have our wastebins in the hallway (in huge, old buildings) and especially for students like I am b) that we do not leave our bikes on the street. My mother always said: the heart of every home is the kitchen. And wo am I to disagree. 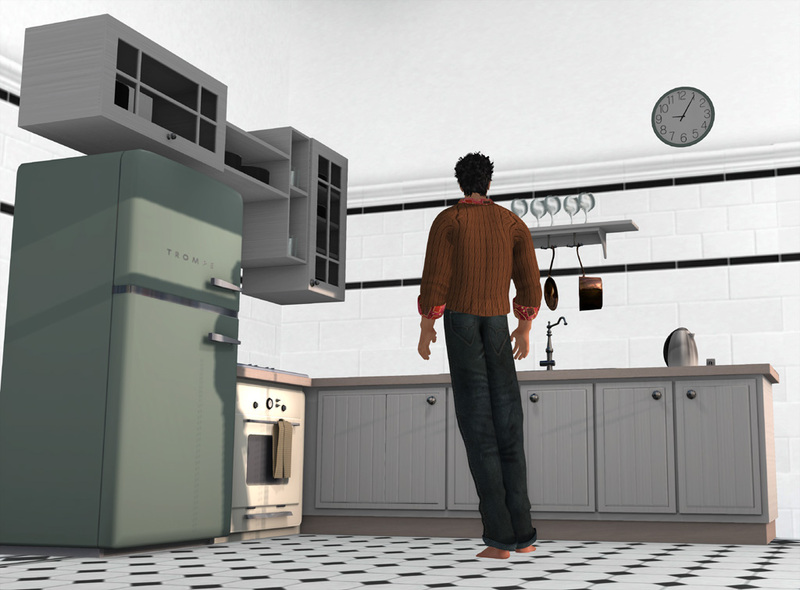 There are a lot of kitchens in secondlife, but this one is definitely my favorite. It comes from Trompe Loeil and is the current item for Collabor88. 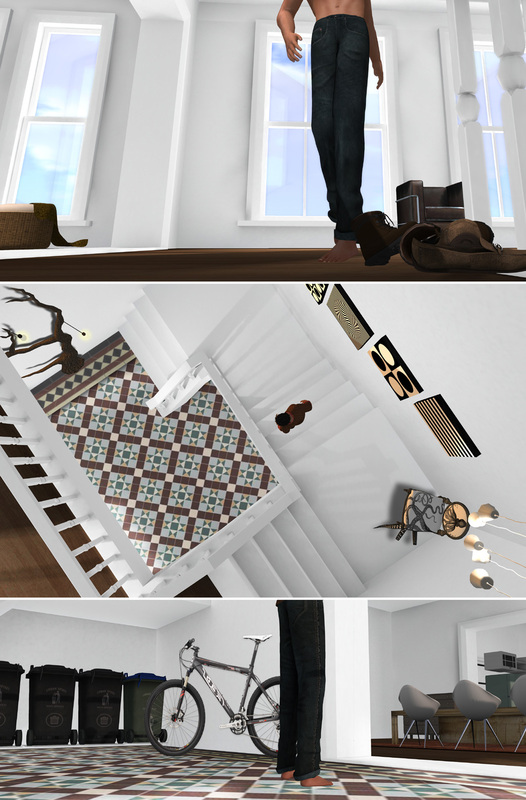 First – like everything that Trompe Loeil releases – the texturing and the overall look and feel is flawless. What really impressed me a lot was the set up of this kitchen. With the “kitchen planner” – wich is also the rezzer for the kitchen – it is so easy to move the complete furniture to the right spot. One click install – this kitchen definitely fulfills this task. Of course the kitchen comes with cute animations and of course there is a version available with NSFW animations also. The kitchen is available in green, orange, purple – and shown here teal. Noticed the hot water maker on the kitchen? This is a gift that can be found at the Gallery Gift Shop and it is – like the whole event – way cute. Finally breakfast. I am sitting on the Adler Dining Table from Scarlet Creative – and it is way cute. First of all I love to combine rustic furniture with way modern things and second the table rezzes different meals – from breakfast to sushi – there is everything you can dream of. The Classic Fireplace also comes from Scarlet Creative and the drawers are the plain version from the last cycle of the Mens Dept. by floorplan. The skyline picture is again a gift you can get at the Gallery Gift Shop. And the lamps are a freebie from nordari. It is time to get prepared for work. But first I rest a bit on my new won Baroque Bench Popular at the Arcade Gatcha Event. The bench – again – comes from Trompe Loeil and it is super cute and it comes with 15 different animations. My students bag – where i carry my notebook and books and all student stuff with me comes from NYU and is from L’accessoires. Look at the detailing on this bag – isn’t it wonderful? Finally the water dispenser was the huntgift from Nudolu for the Gallery Gift Shop Anniversary hunt. Well – that was a lot! I hope I showed you enough of the fantastic LONDON Apartement by [AF] that you start drooling already. Please note that I did some minor modifications on the skybox since I removed the panorama view over London for lighting purposes. I love your design for this apartment!